When you think of ways to ease your anxiety at the dental office, chances are nitrous oxide comes to mind. 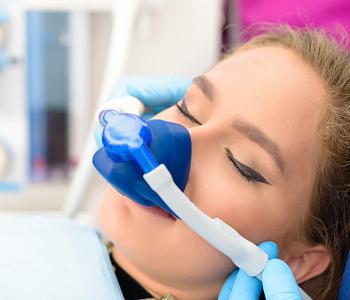 Better known as laughing gas, this sedative option is generally suited for patients with mild dental fears. It may be appropriate if you have a bad gag reflex or are undergoing a lengthy procedure. Virtue Dental Care understands no single sedative option is right for every patient. For this reason, Dr. Virtue and his team go above and beyond with options to ease every level of dental fear. As a holistic practice, the team is pleased to offer innovative, multi-faceted alternatives to conventional sedation to make your experience at the dentist’s office a pleasant one. Very anxious patients can benefit from oral conscious sedation. The doctor will prescribe a pill to calm you down and give you specific instructions. It is advised that you take medication about an hour before your appointment. By the time a friend or family member drives you to the appointment, you will be awake but completely calm. You will be able to respond to verbal instructions or answer any questions Dr. Virtue may ask. The beauty of oral conscious sedation is you are able to retain consciousness, only you won’t be bothered by the sounds, smells, and sensations that cause many patients to panic. In what will feel like no time at all, the treatment will be over and your ride will drive you back home. After resting, you will wake up with no memory of treatment. For those patients who desire a drug-free approach, Virtue Dental Care offers NuCalm. Using proprietary supplements, FDA-cleared Cranial Electrotherapy Stimulation, noise-dampening headphones, and light-blocking eye masks, counteract the adrenaline that causes symptoms like problems breathing, muscle tension, and GI distress in anxious patients. Don’t let fear keep you from the care you need to look and feel your best. There is sure to be a sedation dentistry option in the Piedmont NC area that helps you get through everything from standard cleanings to invasive restorative procedures comfortably. Find out more about your options. Virtue Dental Care Patients call (336) 679-2034 and New Patients call (336) 679-2034 today to schedule an appointment.